12 TON COMPRESSION TOOL | Tallman Equipment Co., Inc. 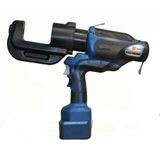 The REC-B6510K battery powered compression tool is designed to accept Kearney WH-2, PH-2 and WH-3 style dies. Weighing just 13.5 pounds it was specifically designed for use in single-handed operation in overhead applications such as cable tray. It also eliminates the cumbersome hoses and larger, heavier tools traditionally used in overhead work. ; The REC-B6510K has a full 12-ton capacity and its 1.5 inch jaw opening accepts lugs up to 1033 MCM. Compression head rotates 180° for use in any position. ; Accepts “WH-2”, “PH-2”, and “WH-3” Type Dies.